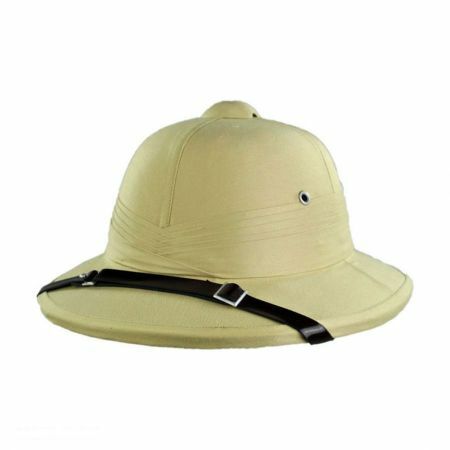 Featuring a dark khaki cotton twill with a stylish creme pleated hat band, the African Safari Pith Helmet is ready for adventure! For Bulk/ Wholesale Purchase of this hat, CLICK HERE or call us at 1-888-847-4287. Understand it is hand made but was disappointed there was glue glob on the inside brim. It was what I was looking for. very nice hat. I use it kayaking. easy to use web site. fast delivery. excellent purchase. My Uncle is extremely pleased! My uncle recently asked his sister for her pith helmet from her 1950's expedition to Africa. He had borrowed it long ago and living here in Florida he found it very "cool" due to the venting and the design. Unfortunately she no longer had it so I told him I would search out a new one for him. 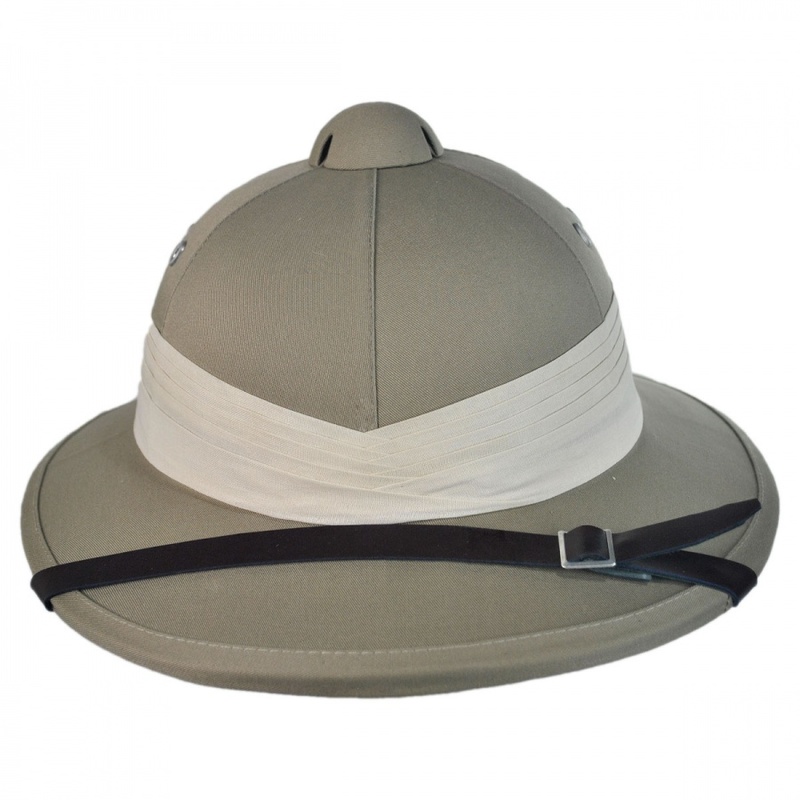 It took me a few websites but when I found this company and in particular, this pith helmet, I knew my quest was over. I read the reviews to him over the phone and told him I was pretty sure this was the one after reading what others had said about it. The fact that it was adjustable was a huge plus. All in all this was a great company to work with. When other people reviewed this product and said they loved it you can add my uncle to that list. I bought this as a gift for a friend. She absolutely loves it! It is comfortable and stylish. I'm going to order one for myself. Perfectly fit because it is adjustable,and it arrive just on time.Thanks village hat. I've worn the beret that I purchased from VHS for years now and haven't been disappointed. 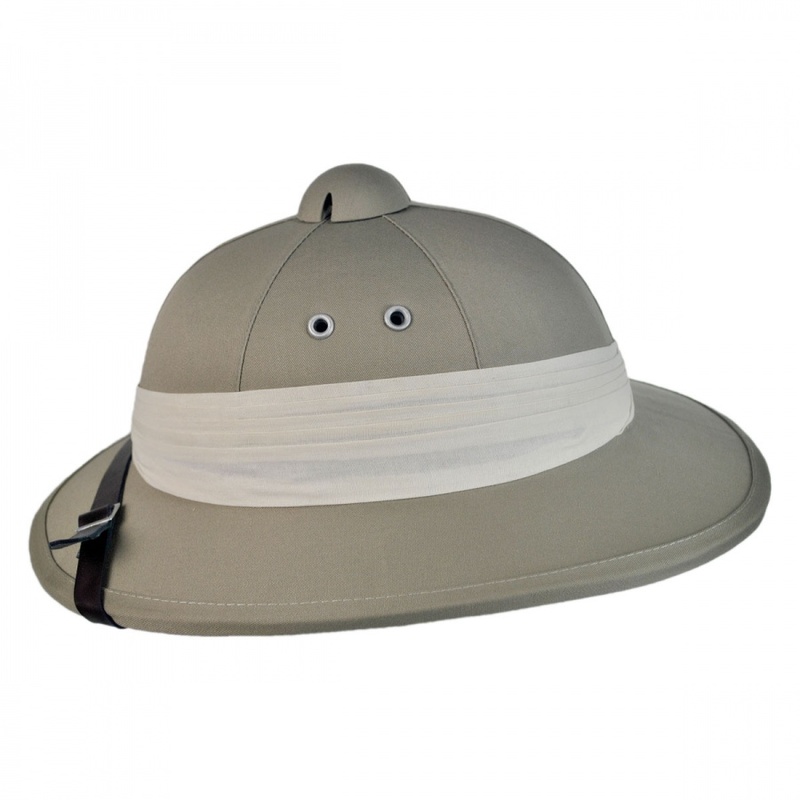 I've always wanted a real Pith Helmet but have never found any other that cheep costume knockoffs made of Styrofoam. So when I saw them on the VHS web site, I had no reserve about ordering one. The biggest problem was choosing which style! When I opened the box (which arrived quickly) I wasn't disappointed. The quality and appearance was as good as the picture online. I can't wait to wear it to the forests of the Cascades, the Oregon Coast and the deserts of Eastern Oregon! If you are considering a Pith Helmet, then buy one here. I hope that the only problem you have is which style to get. bought this for my girlfriend who is an archaeology major and she was thrilled! loved it an has been wearing it none stop. light weight, very comfortable. well made! good job you guys! My Girlfriend is a big fan of Disney Animation Films. One of her many favorites is Tarzan. She always wanted a Pith Helmet ever since she saw the one Jane wore. So I decided to get her one for Christmas! I have to say that this is one of the best constructed helmets I have had the pleasure of ever purchasing! The materials that were used are excellent, and the craftsmanship is unbelievable. A real work of art, but also very functional. 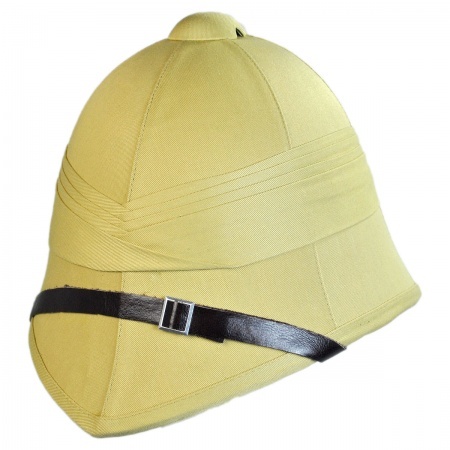 I'm not one for Pith Helmets, but after inspecting and wearing...I might just be getting one of these for myself! Thank you Village Hat Shop for the fine work! Looks great. I wish it had the suspension system the french pith helment has. It is not as well put together as the Frencg helmet. this is the second safari hat that I have bought. I use it while playing golf. It is a good hat for windy conditions. I have placed an additional chin band to the helmet. The quality is good but the headband is less compared to 1st. I can recommend this one.You will look good in it! 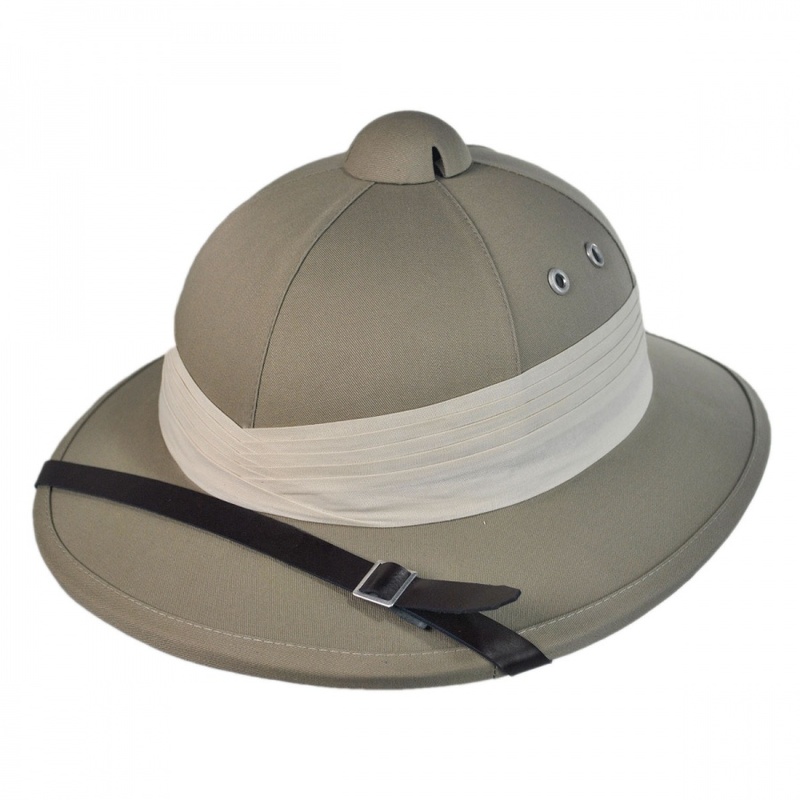 A pith helmet is THE type of headgear to wear in extremely hot and/or humid climates. 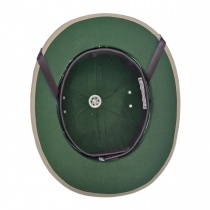 The unique suspension keeps the helmet itself away from your head and allows air to circulate inside--only the leather sweatband makes contact. The helmet itself is very light and you'll likely forget that you're wearing it. 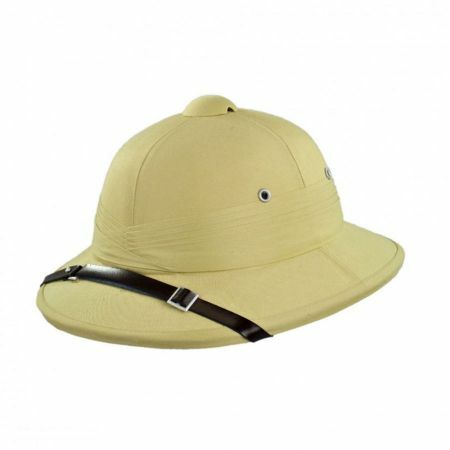 These are a bargain and it's amazing that you can still find a classic genuine pith helmet in this age of baseball caps and polyester! Thanks Village Hat Shop! If this hat is kept wet it will keep the wearer cool in even the slightest breeze. The chin strap is not really needed, however the buckle is a little flimsy for my liking. This makes the chin strap entirely decorative. Arrived quickly and in great condition. Product matched it's picture and description. Bought it for my dad as a gift; he is going to Egypt and it was just what he was looking for! He loved it and I would absolutely recommend this hat and the Village Hat Shop! Super purchase!! I bought a khaki African Safari helmet and a white British Zulu helmet and received both quickly and in excellent condition. The packaging was very protective and items were received exactly as described. I am very pleased with the quality of both. Thanks again. 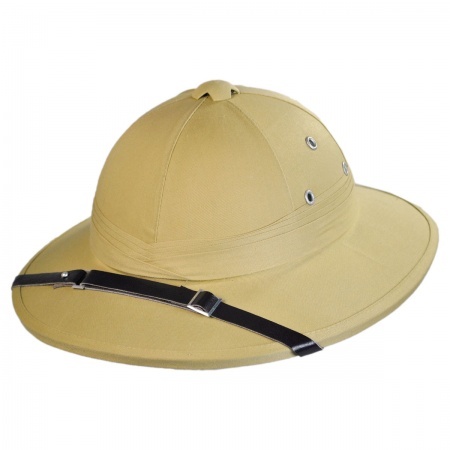 I bought a pith helmet from another vender to take on Safari. It was a cheap knock-off that did not perform well. Since I plan to return to Africa, I looked for a better quality hat. I found it with this one. I can hardly wait to put it to the test. The hat is self is nice. There was a bug chew hole and some bug poop on the white cloth band, the holes in the top did not all line up (easy to fix myself) and it does not fit quite right. Other than that the hat is self is good and does the trick. I bought this hat to decorate my conservatory. I live in a Bahamas style beach house. My glass conservatory overlooks the beach. I had a bird cage, and other things, but needed a few more things. I saw the movie 'Australia' and was inspired by their conservatory, and the man wearing the African Pith Helmet. I thought it would go perfectly in my room. Also, it's wearable, should I have the need for it! This was my first order from Village Hat Shop. This pith helmet fulfilled a many years old desire, and I must say I have absolutely no regrets. This product is well made and is so inexpensive that one just can't go wrong. Believe it! I bought this to wear on the lake while sailing, and adventuring etc. Really nice, comfortable and cool. Pounding on my Bongos and wearing my African Safari Pith Helmet is Daddy-O Cool at Myrtle Beach!!! very good hat, believe me i've tried several. It is a great hat, i wear it in my travels to the humidous-hot regions of my country (Mexico)When some people ask for it I answer ""I am a fugitive of a Tarzan film"", always this answer broke the ice and I made several travel friends because my hat. When I occassionally help with grounds maintenance at our local church, I always wearing this pith helmet. Taking from the usual ""going on a safari?"" remarks in stride, I have found that this helmet actually does a wonderful job of preventing sunburn on the sides and back of my neck as well as on my face. And after dipping it in water, the cooling effect of the evaporative properties of the cork (pith) construction leaves me in a far better state at the end of the day than those poor saps adorned with mere baseball caps. I bought this helmet for my wife. She loves it! It keeps her cool and protects her from the sun. People always ask where they can get one. She tells them on line at The Village Hat Shop! Excellent. I need for my real safaris at the amazo jungle, and it fits very well. I bought this hat for use in a safari costume, but I really enjoy it. It's so light and comfortable, yet feels like it gives great protection. I'm planning on bringing it to Burning Man next year, and definitely on any trips to the tropics. I needed this hat to complete my "" safari hunter"" costume for this past Halloween. 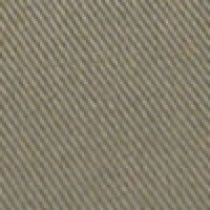 It is exactly as pictured, and I was impressed with the quality. 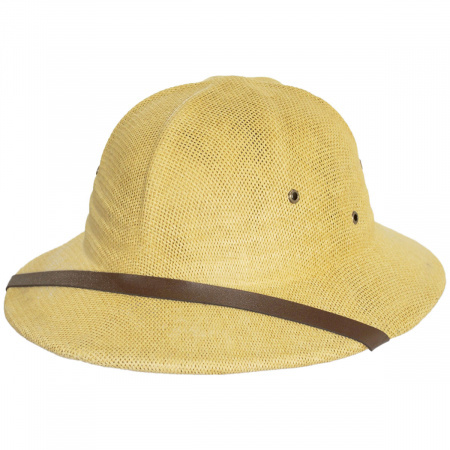 Everyone who saw it asked about it, and it was a kick letting them know, ""this is an actual, REAL, pith helmet."" That alone was pretty cool.So, now, it is clearly not just a costume accessory. I am thinking very hard to discover or invent reasons to wear it more often.But, I found myself wishing I had selected the British style, instead. It seems a little edgier. Nonetheless, the African Safari Pith is now an esteemed member of my modest collection.